I began October on holiday in the south of France, where I was learning about landscape photography with Andrew Whittuck. I had a great time, and returned with a new appreciation of photography. I've spent a bit of time this evening at a neighbour's house. His eldest son's PC was suffering from an absolutely full hard drive and they wanted to know what they could safely delete. Once I sat down and had a look at the machine, I realised it had some more serious problems. The RAID controller was throwing up errors as soon as the PC booted up, and even though running CHKDSK spewed up dozens of "fixed" messages, there wasn't an awful lot more I could do - I suspect the hard drive's on the way out. The evening reminded me just what a dog's breakfast of an operating system Vista is. There is no way I would ever let it within spitting distance of any of my systems. Things that would have taken me a couple of mouse clicks in XP are buried under interminable layers of "security" and every time I tried to do something even remotely connected with the OS, the machine chimed politely and threw up a confirmation dialogue box asking me if I was sure I really wanted it to do what I'd just told it to do. No wonder Vista struggled in the popularity stakes. I will probably end up getting a new system next year, and by all accounts Windows 7 is an improvement - although I'm still tempted to say "to hell with it" and replace whatever comes on the machine with Ubuntu. It's good to have a hobby. I'm not sure where Agan Harahap is going with these pictures, but I like how he's getting there. I've embedded a few more pictures from my photo holiday in the blog entry at the bottom of this page, which I hope you'll enjoy. I can't believe it's nearly a month since I got back; I got a very nice email from Andrew this morning and he tells me that he's put some dates up for next year, including a short course that will run on the 22-26 April. I've just finished reading On Some Faraway Beach, David Sheppard's biography of Brian Eno. It's an interesting read. If you're interested in modern music I'd recommend getting hold of a copy, even if Eno's activities over the last fifteen years are covered rather hurriedly in the last fifty or so pages. I've always enjoyed Eno's work, although it's only in the last ten years or so that I've really begun to appreciate ambient music. As I reached points in the book which mentioned the recording of albums that I have in my collection, I dusted them off for a listen. Once I started, I realised what an incredibly prolific career the man's had. Reading though his discography I was amazed by just how many albums I own that he was involved in making. At the moment I'm sitting here listening to the first album he recorded with Robert Fripp, an instrumental record called No Pussyfooting. I've had the album on vinyl for years, but reading the book finally prompted me to buy the CD release. No Pussyfooting happens to be the LP that John Peel famously played backwards when he was supplied with an early tape of the recordings by Eno. Perhaps to commemorate this fact, the reissued CD contains both tracks played forwards and backwards - and the Heavenly Music Corporation can be listened to at half speed for good measure. It's an album of blistering Fripp guitar and long tape loops, a technique that was well suited to Fripp's playing and one that the guitarist has returned to many times since. To be fair on John Peel, the guitar on No Pussyfooting was often recorded backwards, and the music is still eminently listenable when it's played the wrong way round. There can't be many artists you could say that about! Are those light bulbs working? I dunno, but for the last couple of days I've been sleeping like a log. Last night I was so tired by teatime last night that I decided to have a nap (something I just don't do) and when I woke up it was 10pm. As I blogged a few days ago, I've been trying to get hold of some daylight bulbs for the house. Yesterday I finally got hold of some, and last night I switched them on for the first time. The light they give has a noticeably blue cast and it takes a little getting used to. While it's not the same as sitting out in the sunshine, the experience is much closer to daylight than normal lightbulbs, which tend to have a yellowish tone. The blurb on the packaging claims that the bulbs give off twice as much light as an old-fashioned 100 Watt incandescent bulb, and they're certainly bright. I just hope they'll be enough to stave off SAD this winter. Thanks to Colin for pointing me at this online collection of album covers from the Blue Note record label. Just look at that typography - the epitome of fifties design goodness. Absolute perfection. I love XKCD. Let's all sing along! I'm enjoying ABC's new science fiction television series Flashforward a lot - the idea has a lot of promise. But something was bugging me about the plot, and I've just realised what it is. Why is it that nobody in any of the flashforwards that we've seen is reacting to an experience that they are already familiar with? After all, everyone around at the time will suddenly find themselves reliving the moments from their vision. So why have we not seen a single character in a flashforward react to the onset of the vision, by saying "Whoa, déjà vu," for example? By the time the events in everyone's flashforwards come to pass, I would have expected pretty much every man woman and child on the planet to know the exact time and date that those events were scheduled to occur. So why don't we see anyone anticipating, commenting on, celebrating, reacting to, or - more to the point - attempting to disrupt those events? The only way I can see for the plot of the show to retain consistency is if the events seen in the future happened on a different timeline, one in which the flashforward had not occurred. That has a huge impact on issues such as Demitri's future, for instance. I wonder if anyone on the show will figure it out? If they do, I wonder what they'll do about it? Responding to suggestions that parents might think Where the Wild Things Are is too scary a film to show to children, Mr Sendak had a pithy and absolutely correct response: he told them to go to hell. Facebook applications are a serious security risk, says a spokesman for the internet security firm AVG. Well, duh. Once I figured out what the permissions dialogue was effectively asking me to let somebody's unknown program do with my account, I've made it a point not to install applications on Facebook, ever. These days, installing a new app on Facebook is about as risky as parking your car and telling the first passer by that you meet that you've left the keys in the ignition. You're leaving yourself open to all sorts of trouble. Another cloud computing enterprise is having, er, "issues" with their customers' data. We've been told that cloud computing - where we let somebody else look after all our files so that we can access them from anywhere in the world - is The Next Big Thing in computing, so it's rather unfortunate that the companies who are expecting us to let them store our information have had one or two problems of late. I think I'll stick to keeping my data where I can make sure it's being backed up, thanks. I fully expect to see cloud computing being denounced as "the Emperor's New Clothes" within the next eighteen months. Some of the sharper analysts have already started raising sensible questions, and I don't blame them. It's just after 6 in the evening and the light outside is already fading. Next weekend the clocks go back and it'll be pitch dark outside at this time. The weather forecasters on TV over the last few days have started to mention ground frosts. Autumn is definitely here, and the leaves from the trees outside are falling; on Monday I filled up the green bin with them, but the garden is covered again. October used to be my favourite time of year, as I loved feeling cosy inside as it got foggy in the evenings. I particularly enjoyed getting the extra hour in bed on the last weekend of the month. But last year I felt very low as winter drew on, and this year I'm not looking forwards to the reduced hours of daylight at all. So I've been looking at ways to counteract the "winter blues." The most successful remedy I've come up with so far was to go on holiday, and after a week in the south of France basking in glorious sunshine I felt great. Sadly, that's not going to be a practical solution for the whole of the next five months. I've been looking at getting some full spectrum or "daylight" light bulbs for the main rooms in the house. My first attempt at ordering some "daylight" light bulbs ended in failure as the manufacturer had stopped making them, but I've just tried again with a different supplier and I'll let you know how I get on. Judging by the reviews I've read, I'll know almost instantly whether or not they work for me. Please allow me to share my latest obsession with you: the haunting, impressionistic photographs of Alexey Titarenko. The City of Shadows series is one of the most extraordinary collections of photographs I have ever seen. Photography is one of the hardest mediums of all in which to develop a style that is both instantly recognisable and unique, but Titarenko has clearly achieved just that. I've had the headphones on a lot today, listening to the new album by Newton Faulkner called Rebuilt by Humans. It's a worthy sequel to 2007's Hand Built by Robots, which the troops bought me for my birthday and which turned out to be one my favourite albums of the year. I saw him perform live at the Latitude Festival in July this year and he was one of the best acts there. He played Won't Let Go (after setting up the background loop live by playing it into his loopstation) and If This Is It from the new album at Latitude, and it says a lot about his songwriting abilities that I remembered them; I already have a feeling this will turn out to be one of my favourite albums of the year. So, what does the new album sound like? The arrangements of the songs are more complex, certainly; there are even violins to be heard at one point. Newton resurrects his "human Theremin" skills on the new album, and produces a pretty impressive multitracked melody. One track reminded me of Peter Gabriel, another of both Adam Faith and The Police (and there's an interesting combination, to be sure), but every track is stamped with Faulkner's unique sensibilities. Bristol traffic has been chaotic since the new university term started. It took me over an hour to get home from the office last night and the same thing happened on Tuesday. One reason why the blog hasn't seen too many updates this week is that I've been really busy and by the time I've made it home, had tea and sorted myself out it's pretty much been time for bed. Things weren't helped this morning by the fact that the Highways Agency had closed nearly thirty miles of the M5 south of the city after a car went off the motorway just before an exit slip road, rolled for 40 metres and hit a pole, bringing down a set 11,000 volt power cables that run across the carriageway. Chaos ensued, naturally. The New Scientist is running a gallery of images from this year's Nikon "Small World" microphotography contest and there are some beautiful images on display. I thought the 18th place entry, entitled "brainbow" and showing a cross section of the hippocampus of a transgenic mouse, was particularly striking. But my favourite has to be the photo of some caffeine crystals, for obvious reasons. It's beautiful. Wow, Rob and Ruth turned twenty today. They're no longer teenagers, although Ruth reckons she's now twenteen, which sounds like a good age to be. Happy birthday, troops! Happy birthday also to Linsey, who is another of my regular readers. Hope you're having a blast down in the big smoke, old chap. There are some other birthday celebrations going on in London today - for someone who I went to school with, as a matter of fact: Kirsty MacColl would have been fifty this year. It was her birthday yesterday. I've spent most of this afternoon writing. I was helping a mate of mine out with his website yesterday and I realised I hadn't touched my Groups Page for the best part of four years. Given how much my musical listening habits have changed since then, it was more than overdue for an update. I also needed to change it because it's one of the most frequently visited pages on this website. So why not mosey over and have a read of my shiny new content? 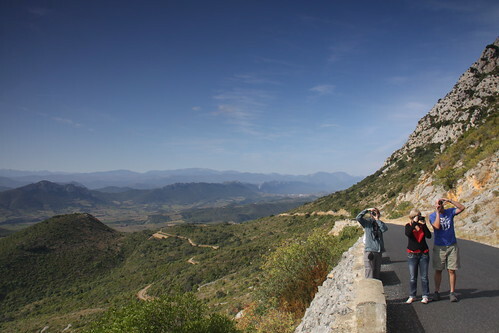 I got back from Perpignan yesterday, arriving home just after 11pm. I've had a fantastic week's holiday. There was so much to do that I didn't really have time to keep a record of it all; I think the best thing I can do is to work through the photos and post the best on Flickr, with little annotations about when and where they were taken - but here's a brief summary of what I got up to. Back at the house, Nick not only identified our photos but explained that the specimen here was a female - the scary-looking stinger is actually an ovipositor. He also told us that they're known for being particularly stupid insects! 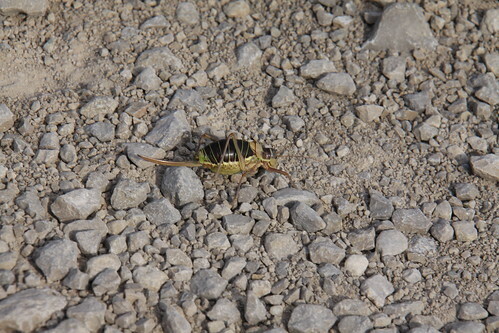 Fawzia mentioned that she's seen a preying mantis today, which got me very excited as I've never seen one. After coming back down Mont Tauch we got some great shots of Chateau Agilar and the sun setting over Padern Castle - I'll be uploading some of those photos later on this week. Tuesday morning was taken up with one-to-one sessions with Andrew. While we waited our turn, we walked a little of the way down the valley to an abandoned house. La vendange was well under way, and Kelly and Victoria managed to talk the owner of the harvesting machine to let them climb on board and take some photos! In the afternoon, we went for a walk in the hills above Dernacueillette. 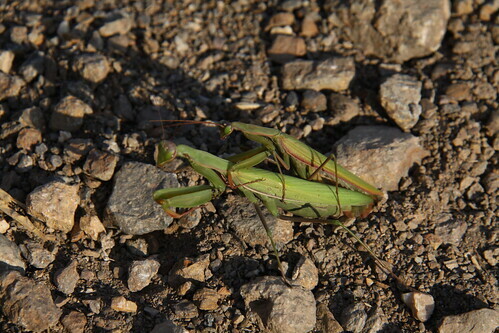 Lo and behold, as we walked down the road towards yet more vineyards, there in the middle of the road was a pair of mantises, doing what nature intended. I didn't wait to see if the male met his traditional fate. In the evening Andrew took us into the village to try our hand at night photography. It was great fun - partly because everything on the holiday has been fun, but also because we really enjoyed how the long exposures gave us the opportunity to appear in the picture not just once, but several times! We spent ages playing about with tripods and flashguns, and got some very entertaining results. Wednesday is market day in the region, and we headed to the town of Lezignan to take pictures of local produce and the shoppers making their purchases. It was quite a contrast trying to take pictures of the hustle and bustle compared with the tranquillity of the last few days. I took several photos that I was really pleased with. After lunch in a really good restaurant on one of the back streets, we headed off to the town of Lagrasse, where the Abbey of St Marie d'Orbieu was founded in 799 AD. The history of the whole Aude region is fascinating - over in Tautevel human remains have been discovered that are approximately 450,000 years old, but it's the association with the Cathars that sticks in the memory. 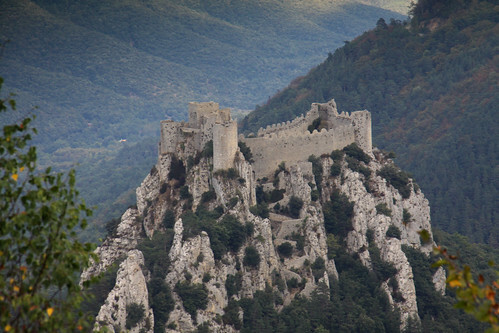 We visited castle after castle during the week and each one had been besieged at some point in its history - mainly by armies following a crusade called by Pope Innocent III against a religious group known as the Cathars. The Catholic church had decided that Catharism was becoming too successful a belief system to go unchallenged, and the occupants of the castles were summarily massacred once they surrendered. Given how small the population of Europe must have been back then, it's chilling to think that up to a million people were murdered as a result of the crusade. As for us, we stopped briefly in the hills above Lagrasse to catch a view of the bridges as the light faded, then it was back to the house for another wonderful meal. The wild boar came back - I was woken up by it rooting about in the undergrowth outside the bedroom window at five in the morning! Sadly it was too dark to see exactly where it was and I completely failed to get a picture of it. Another sanglier rushed into the bushes at the side of the road when we were coming back from a meal on Friday night, but again I failed to get a photo. Ah well; maybe next time. Back down at the foot of the mountain in the village of Cucugnan, we have lunch at the Auberge de la Table du Curé - the food's amazing but someone really needs to have a word with them about the graphics on their website! After lunch we head off to another château perched precariously above the trees; this time we're at Puilaurens. Surrounded by thick pine woods, it's very striking, but it's rather obviously the poor relation to Quéribus and the woman who runs the guest shop makes it quite plain she can't wait to shut up shop and go home. We drive and then clamber up a nearby hill to take pictures looking down on the castle, but for the first time all week the light is going. It's still an impressive sight. As we take pictures it's clear that the weather isn't playing along, and when we arrive at Andrew's favourite spot at the end of a striking avenue of trees, the sun goes in for the evening. We make the most of it, but there's a sense of disappointment that we couldn't get the right picture. Andrew kindly reschedules the whole of tomorrow so we can head back and try again. Today the weather is obviously trying to make amends. The stiff breeze of yesterday has built into quite gusty winds, which are blowing any clouds across the landscape surprisingly quickly. As a result, the light today is fantastic. On the way back to the avenue of trees we stop several times because what we're seeing out of the car windows is so striking. Cucugnan looks like it's been lit for a film; dropping down the other side of the ridge from Quéribus towards Maury the Pyrenees seem to stretch off for a hundred miles, and they probably do. We stop at Maury to take photos of the many examples of trompe l'oeil painted on the walls. Apart from one man working on the roof of a terraced house, the town seems deserted, but as we snap away at the pictures on the walls the town's tannoy system bursts in to life to announce a multimedia experience which will take place later. It feels a bit like being in The Village in The Prisoner; it's far too complex a system for plugging local entertainers, surely? Back at the avenue of trees, and the light is great. We spend half an hour or so snapping away at the rows of plane trees, and everything is right in the world. On the way back we detour towards Estagel and a tiny house in the middle of all the vineyards that is perfect as a photographic subject; after some experimentation we even discover that the tree behind it can be used to hide the electricity pylon that stands between it and Quéribus in the background. With a polarising filter, the cumulus clouds above the château pop out like they were hanging on wires, and we get some great photos. In the evening Fawzia joins us for a fantastic last evening dinner at L'Auberge du Vigneron in Cucugnan. We sit at a table with an enormous wardrobe positioned at one end - it feels quite feasible that we could step through it into Narnia. The food was the stuff of storybooks, too; for a starter I had the best boudin I have ever eaten, followed by rabbit fricassee and a dessert of summer fruits and blancmange. On the way home the headlights catch a sanglier and a wild hare before they disappear into the darkness. We get home late after a very long but rewarding day and roll into bed. I slept like a log. Today I got up an hour before breakfast and took a solitary walk up to the Cascades above the village. The sheep were back down in the valley, bleating away as the sun began to rise, with the bells on their collars clanking away. I spent the best part of an hour taking in the landscape that I've developed a profound appreciation for; in taking so many pictures of the area I've become deeply attached to it and I sincerely hope it won't be the last time I get to visit the place. 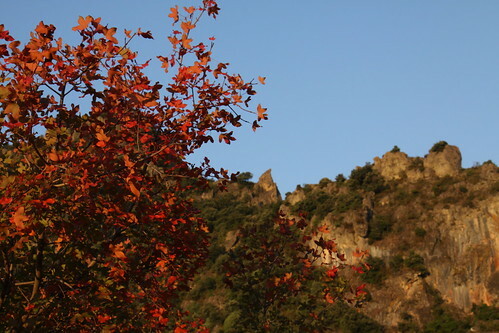 Once I'd climbed up to the sunshine by the waterfall it was a warm day, but it was obvious that summer won't stay in the Languedoc forever; the leaves on the trees were beginning to turn orange and red. I bet the place will look even more wonderful as the autumn colours come through. As for me, I walked back down to the village and joined the rest of my class. We had to work for our lunch: it was time to present the photos that we chose as our personal "ten best" for appraisal by the group. It proved a very difficult task to whittle down the nearly 1900 pictures I'd taken into just ten, and even if my fellow students hadn't been quite as prolific as me they were finding it just as hard. So we ended up showing our best fifteen to twenty pictures instead! The photos that Caroline, Kelly and Victoria showed were great - some were really striking, others were witty, and still others were dark and mysterious. We appeared to have done enough to earn our food, too, as Chrissy presented us with bowls of amazing fish soup - the recipe was from Norway and involved large amounts of cream and butter; it was wonderful stuff and I couldn't refuse the offer of a second bowl full! As usual, I managed to spill some down my shirt but only noticed when we were sitting in the departure lounge! After an all-too-brief siesta in the deckchairs in the garden it was time to head back to the airport, bid Andrew and the Languedoc goodbye, fly back to England and drive home. But I have a computer full of photos that will remind me of the holiday for years to come. It's been a very memorable week, and without question one of the best holidays I've ever been on.